I figured that news about the breakers could have it's own thread instead of being split up all over the forum.??? "Global Marketing Systems"???? At least I have a new name for my voodoo doll......now, where did I put the especially painful pins???? WOW, now that is a surprise! But if the legal system in Bangladesh is anything like that in India i wonder how realistic such a ruling would be? 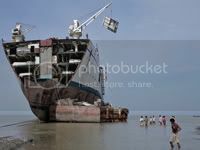 The ship breaking industry in Bangladesh must inject millions into the economy, i find it hard to believe it could be closed down over night. I should imagine the appeals will be starting already, and no doubt they will drag out for years. It would not surprise me if this just turns out to be a big media exercise - the authorities being seen to be doing something, but the legal implications are causing delays. And im sure that in the time made available by these delays, most of the yards will find a way of meeting minimum requirements - either that or the legal system will relax the laws in someway. 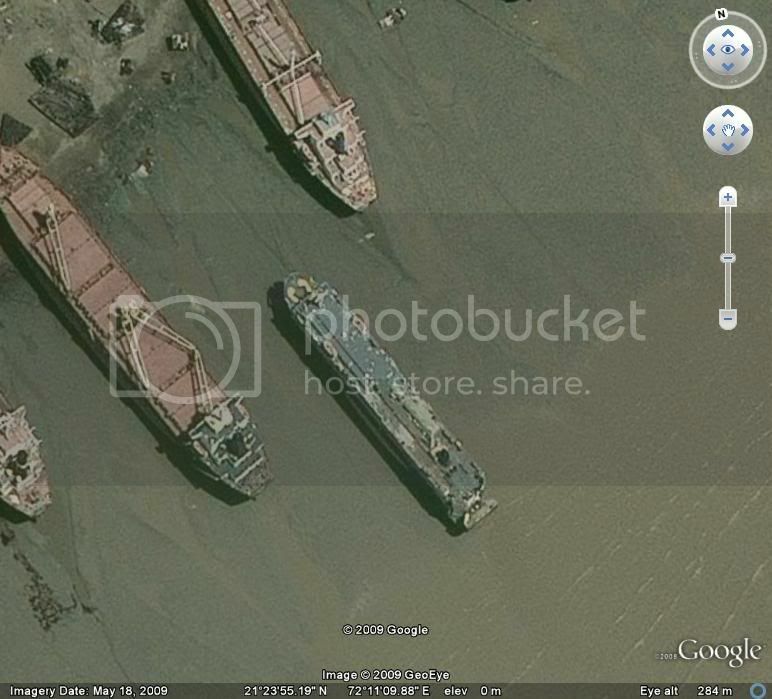 Again, i would be very very surprised if all ship breakers of Bangladesh suddenly closed down overnight. Good news it is, but I don't think I'm quite convinced before I actually see it. Any idea which ship this may be: a white hull probably indicates a passenger ship, or a reefer ship? Google Earth's image of Alang as been updated, you will see from the image below that it now shows an image dated 18 May 2009. Sadly however, only 3/4's of the Alang site has been updated. And just our luck, it would seem that the one quarter that has not been updated is the part that contains some of our favourite ships. Anyway, go and fire up Google Earth and have a look. I have noticed a couple of things from the updated image. For one they seem busier than ever - car carriers and all sorts of vessels. And two, they seem to have all of the merchant ships on the south western stretch of the beach. And much to my frustration that is the area that as been updated. I assume that all of the passenger vessels are in the non updated north eastern stretch of beach. I am rather surprised that they seem to be that organised, could this be because they keep all of the fittings and furniture from passenger vessels in one particular area? If so I guess it saves them from carrying it all for miles along the beach. You will also find up-dated images of Chittagong Bangladesh. Thanks for that Remarc. After looking at Chittagong I have to give Alang a little credit, have you seen the state of operations at Chittagong? There are just bits of ships left laying everywhere. Looks like they just keep moving from vessel to vessel without actually ever finishing anything! Alang looks very well organised in comparison. I just wish Google would update the rest of the image from Alang. Although the Gujarat government has set up a separate Inspectorate of Factories at Alang ship-breaking yard under its Industrial Health and Hygiene (IH&H) Department to enforce safety provisions, two more fatal accidents have been reported from the world’s largest ship-breaking yard in the last one month. The recent incident that occurred on the 1st June on Plot 15 of the ship-breaking yard involved a labourer identified as Ayodhyasingh Rajput (35). Rajput was a native of Jharkhand and was employed by a local company named Chantivala Contractor. The authorities have confirmed that the incident bore resemblance to yet another fatal accident that occurred at Plot 24 D in May. In both the cases, workers died when the crane’s rope carrying big steel plates cut from discarded ships broke and fell on them. And this, when the ship-breaking industry is one of the few sectors that have benefited from the global economic meltdown. The ship price per tonne has fallen to $250 in a year from the high of $750 in June 2008, indicating a fall of nearly 60 per cent. On the other hand, steel prices have fallen by only 40 per cent resulting in a good margin for ship-breakers. And with nearly 25 to 30 vessels hitting Alang shores every month, the ship-breakers are minting money like never before. NOT surprised at all... these two stories came through to the media, I bet there are quite a few more accidents and maybe even deaths being "hushed" down..
Alang: The Realm of Lost Ships. This is an interesting short essay that someone's written about Alang, it would appear that the accidents are not only happening on the beaches. Latest Images of Topaz, Maxim Gorkiy, Regal Empress and Ocean Odyssy. All times are GMT+1. This page was generated at 01:24.